“Last semester I attended a fake news workshop facilitated by the libraries. We explored different sources, analyzed contributing authors and their credibility, and thought about the different psychological forces at play when viewing manipulative media. 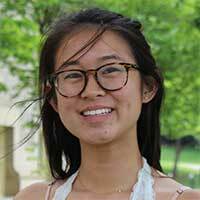 The series was highly relevant to my independent major focused on persuasion and propaganda, and very thought-provoking given the current political climate and influence of online news.” Claire Liu ‘19, Independent Major.